We met with Dr. Chaudry today, she is Allie's Endocrinologist at the Marshfield Clinic. This was a follow up appointment for her height and weight. We were there about 4 months ago and Allie's weight and height were of quite a concern because they hadn't increased much. It's basically the same story AGAIN! Allie weighed 28 pounds today and I cannot remember her height right now but it hadn't increased much since our last appointment. Allie's weight is 1% on the chart and her height is at 4%. Her weight is falling farther down the chart and her height is staying about on the same curve. 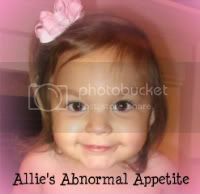 Dr. Chaudry confirmed today that Allie has very low muscle tone and very very weak refluxes. The low muscle tone might help solve the reason that Allie always seems to fall. If Allie stays on her current height curve, her preliminary projected height (as the best case scenario) is 5 feet tall. 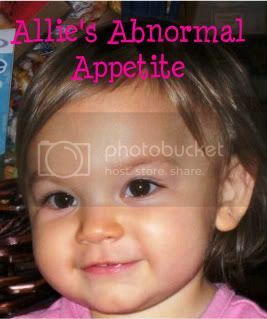 Dr. Chaudry said that Allie is a candidate right now for growth hormones but she said she would prefer to watch her for another year and then make the decision whether the hormones are right for Allie or not. We agreed with this because in all honestly, we don't want to put Allie on growth hormones unless it's ABSOLUTELY necessary. Allie had blood work done today to check for numerous things including, zinc, iron and vitamin C. She also had another bone density X-ray of her hand. Dr. Chaudry is thinking her bone age has fallen farther behind than before - but this will just confirm if she's correct or not. We should get results to the tests within a week. Right now we really need to focus on getting more calories into Allie. With her ability to only handle small amounts of liquid every couple hours, it's such a challenge to get food into her. We are thinking of putting her back on the pump at night - but that's just such a set back for her stomach and her brain communicating when her stomach is full, etc. However, I have a feeling a set back might be what is needed in order to move forward with her weight issue. We already add Duo-cal to her formula and she's on a 1.5 cal formula - so she's getting a high dense calorie intake. If anyone has any suggestions as to how to add additional calories, please share them with me. We are all getting ready for Christmas and the girls cannot wait for Santa to come. We finally got some snow today and the girls played outside almost all day. Well, I should say Chloe played outside - Allie isn't too wild about the cold. She goes out for a little while but then comes in and warms up. We hope everyone has a very blessed Christmas and New Years - take care.